“The amount of discussion and accountable talk that the students are doing is just phenomenal,” Assistant Principal Maria Delfini said recently. Maria is the grade seven assistant principal at I.S. 281 (Joseph B. Cavallaro Intermediate School) in Brooklyn, New York. Across the curriculum, her middle school teachers use ThinkCERCA to engage students in rigorous instruction. They practice the CERCA Framework (Claim, Evidence, Reasoning, Counterargument, Audience) as a means to help students develop evidence-based conversation about literary and informational texts. The ELA class highlighted by the reviewer used ThinkCERCA’s benchmark assessment, differentiated Walt Whitman lessons, and the CERCA Framework to deliver rigorous instruction to students. By implementing ThinkCERCA, I.S. 281 was able to improve their rating in the Quality Review’s Instructional Core indicator 2.2 (Align Assessments to Curricula) from “developing” to “proficient.” After using ThinkCERCA for just one year, the school’s Rigorous Instruction rating improved from “fair” in the 2015-16 School Quality Snapshot to “good” in the 2016-17 School Quality Snapshot. 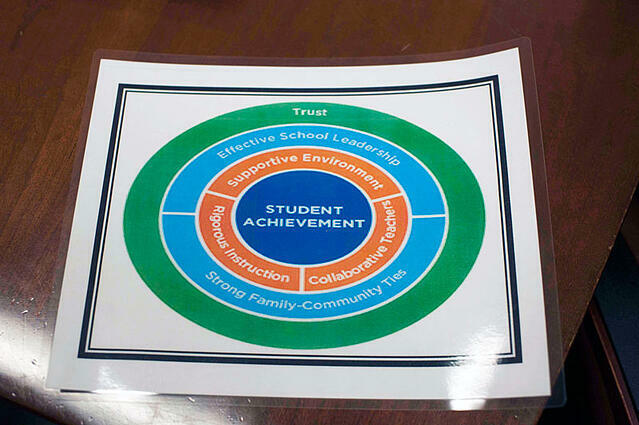 A laminated copy of the New York Framework for Great Schools, which is used to inform the Quality Review, sits on a desk. Definition: Ensure engaging, rigorous, and coherent curricula in all subjects, accessible for a variety of learners and aligned to Common Core Learning Standards and/or content standards. Maria also noted how ThinkCERCA helps her teachers to ensure that their curriculum is engaging and rigorous but still accessible and coherent for a variety of learners. I.S. 281 supports a dual language program, in which students learning English take two classes taught in Mandarin and two classes taught in English. 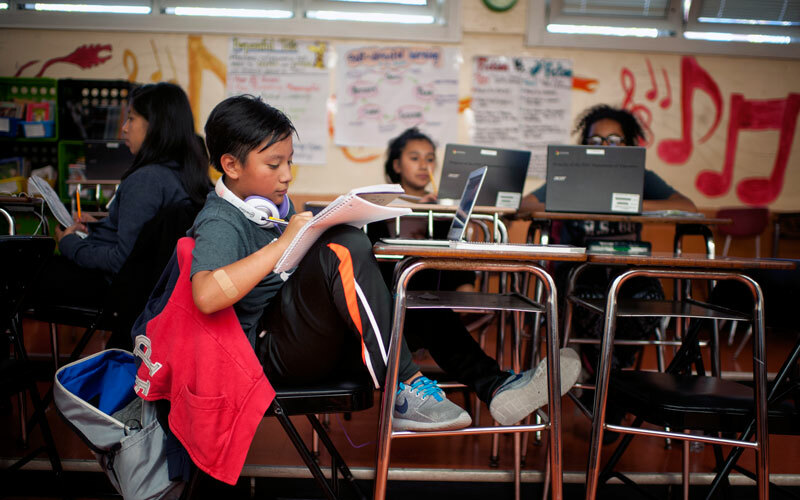 “The growth that we have seen [appears] not only in writing, but also in the academic discussion, and accountable talk with our English language learners, and the results on the state exam – with an increase in their performance levels – and a growth percentile of over 50 percent,” Maria said. Definition: Develop teacher pedagogy from a coherent set of beliefs about how students learn best that is informed by the instructional shifts and Danielson Framework for Teaching, aligned to the curricula, engaging, and meets the needs of all learners so that all students produce meaningful work. The use of writing prompts and essential questions to discuss texts is key to ThinkCERCA’s pedagogy. To ensure that students are able to balance informational reading and literary works (one of the six shifts in ELA/Literacy for EngageNY), Maria said that her classes supplement literature with informational texts from ThinkCERCA that relate to the theme or topic of the novel. In step 3 of ThinkCERCA's Writing Lesson, a student at I.S. 281 engages with the informational text and cites evidence and reasoning to support a claim. Maria also brought up a class she observed recently, which included students with disabilities and students learning English. The teacher and co-teacher of the class were using ThinkCERCA in a Socratic seminar that balanced informational and literary texts. Definition: Aligning assessments to curricula, use on-going assessment and grading practices, and analyze information on student learning outcomes to adjust instructional decisions at the team and classroom levels. By using ThinkCERCA’s Writing Benchmarks, I.S. 281 is able to easily align ongoing assessments to curricula. “Already we’re seeing a difference from the beginning-of-the-year to our mid-year evaluations and we’re definitely seeing growth in our students,” Maria said. While ThinkCERCA has been instrumental in helping the team at I.S. 281 to integrate instructional shifts and implement rigorous curricula across content areas, teachers have also been able to use ThinkCERCA in tandem with other systems, like Code X and EngageNY. 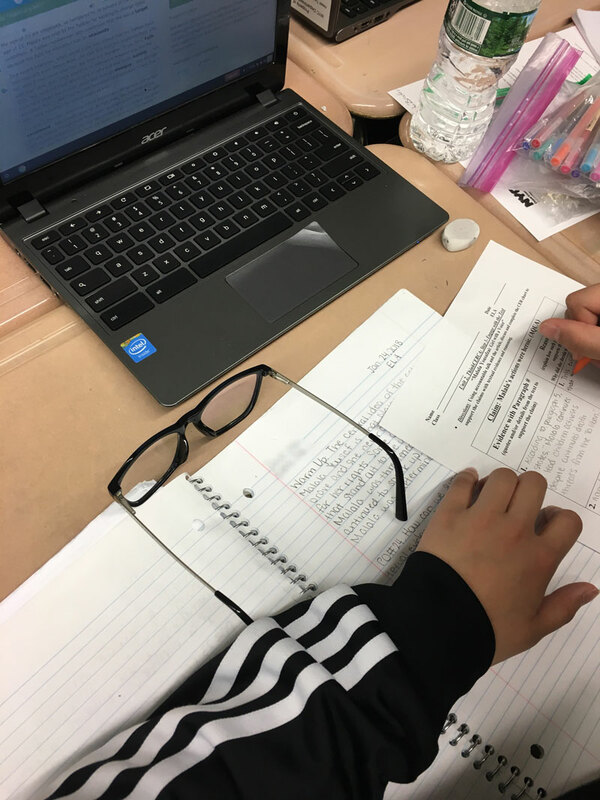 The ELA teachers, Maria noted, looked at the scope and sequence for science and social studies classes and used ThinkCERCA’s articles to correlate instruction to topics that students would be learning about in other subjects. Listen to Corona Arts & Sciences Academy Principal Beth Hert and ThinkCERCA Founder Eileen Murphy discuss the shifts instructional leaders must make to meet all 10 indicators of the Quality Review.